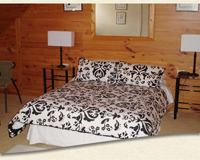 A warm welcome awaits you when you arrive at our wonderful chalet style home. Overlooking the Bass Strait on the north coast of Tasmania, we are ideally located for those who wish to enjoy lazy days by the beach as well as for those who wish to explore the north of the state. Close proximity to the Devonport Airport and Spirit of Tasmania make it an ideal place for a weekend getaway. 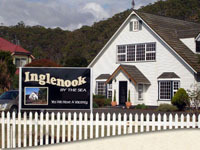 Why not make Inglenook by the Sea your home for a few days while you take in the magnificence of the north of Tasmania? Inglenook has two large luxury suites. 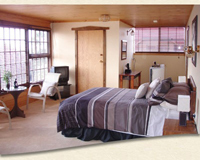 Both rooms have television, dvd, radio, heating, refrigerator and tea and coffee facilities. In the colder months a roaring fire heats the property. Guests are welcome to sit in the lounge and enjoy the experience. Incidentally, Inglenook means ‘a cosy corner by the fire’. Our rates include a healthy, fully cooked breakfast made especially for you, from fresh local produce to give you a great start to the day. There is a wonderful selection of restaurants in nearby Burnie and Penguin for those who wish to dine out. Ample parking is available for guests. We have a no pet policy.